The best! Where ever l go it’s always with me. I gotta have the Sirius and Howard back. A great quality app. A very great service Satellite Radio. I am sold on it. Don’t believe the phony reviews. I pay for it in my car and it works. But the app is total junk. The Best Show In Radio! So much sports, news, country, pop... not a whisper of island sounds, African, Salsa, SERIUSLY? Works really well. Love that it syncs well with Alexa. Invest in Sirius. They are awesome. Along with the two dozen or so I had saved. So much for fixing the “bugs”, right guys? I will subscribe again once Howard Stern is gone. This is a very good station when it is working but for some reason it keeps shutting down. I love the Sirius App! I love having the variety of music available in my bridal salon! I can always find something I like. Great radio. Download problems, crashes all the time and I can’t even login right now. Need I say more? Great App ALICEINCHAINS is live! Radio as it should be! I thank urban view for motivating me to be more active in my community and telling the truth! I just wish me and the wife both could log on at same time but nope. LoVE this product but a band with 7 straight #1 releases deserves a station!! Love listening to Shannon Gunz!!! GREAT MUSICAL AND OTHER SELECTIONS ALL OF THE TIME! Have been with SiriusXM since 2012 and enjoy the benefits of the all access membership. Enjoy the music in the vehicle, phone, Bose home audio! Highly recommend and it looks like we will be adding the group of Family an very soon. I more eagerly await updates for this app than new episodes of Stern, because this app has consistently been terrible and bug ridden since I started using it. Stability ranges from annoying bugs to inconceivably large ones that make it barely usable. This latest update is a real gem, it doesn’t remember your place is an episode downloaded, an on demand episode streaming, or live radio. It’s like it’s being opened for the first time. Pausing play and coming back to the app in a couple hours? Bad idea, it’s like you were never listening to anything....back to pop 1. It’s shocking how many big bugs consistently make it into public releases, especially coming from a company this large. These bugs ruin the experience of using your product. I mean no disrespect but you sell an expensive product, please get it together. My downloads keep resetting back to the beginning instead of where I left off during the previous session. Ie Howard. Kind of hard to scan to my last listening point in a 4-hr show. The music, the interviews the fans. Only Elvis can do 24-7. Put this channel on jet blue too. Very nice to listen to music, sports or news with no interruptions. Can you guys please stop updating the app if it’s only going to make it worse? Episodes just quit in the middle and play channel one and the app doesn’t remember where I was or what I was listening to anymore. I only have this to listen to Howard and I’m one more bad update from canceling my subscription and just downloading the episodes off the web. Update: my first review was July 31st. It is now September and I still cannot reorder my favorites or turn anything into landscape mode. I deleted and reinstalled the app and nothing. I deleted all my favorites and the second I delete the last channel, EVERYTHING that I deleted shows back up. Channels are doubled up in favorites too. Please, for the love of GOD, how do I fix this? I have been trying for about a week to reorder my favorite stations into the order I want to see them. As soon as I finish editing about 40 channels and click “done” they immediately reset to the previous order. The recent update specified that the reordering was fixed. Guess what? It wasn’t! I also can’t get my stations into landscape mode. How about a fix to this as well? Sirius XM 126 is the best talk radio station in this universe! The latest update doesn’t remember where I stopped listening to downloaded shows. It re-starts from the beginning every time. Opens to Hits 1 ?! The last set of upgrades to the app were good, notably the forward by 15 sec button addition. However the latest update has the app open to a “Hits 1” station every time I open the app on my iPhone, rather than what I was previously listening to as it was before....horrible. I only ever listen to Howard Stern, but lately whenever I leave the app and later come back, instead of it being paused to the same Howard show, it’s now on Sirius Hits 1. Every time. This is super annoying. Please make it so it stays on the same channel! I truly enjoy the Sirius Satellite APP. Every time I download something and start listening to it and stop it it always starts from the beginning. Please fix. Since 2006. It gets better every day. From NFL to Hair Nation to the King of All Media !!!!!!!!! Have 2 radios app and on line ! THANK YOU !!!!!!!!!!!!!!!!!! I don’t not know what I would do without it. I love streaming my radio on my phone. Great app! Never easier to stream the best service. Urban view is the best. I love it ! Great variety of music and enjoy listening to commentators throughout day. My second year with my subscription! This is all I listen too! My favorite is yacht rock! My fell good ,get away for song station! Can we keep this station throughout the winter ???? PLEASEeeeeee!!!!!!! I am constantly fuming that I am forced to endure this junk app just so I can listen to Howard. It is always losing its audio stream, even when I'm on fast wifi. Crashes and freezes are frequent. Recently, the app just randomly stops playing an on demand episode, then when I press play again, it starts the episode over! So frustrating! I used to love this SiriusXM app, until they removed the 'custom mix' feature!! What a terrible downgrade. This has become a great app. Update from my last review: still crashes and randomly picks up the HSS wherever it wants. Instead of video feed how about you perfect the functionality of opening the app, listening to the radio, etc? Last month: Shows start over again in the wrong places and they continue to add more “features” when they can’t perfect the features they have. I have been a subscriber since 2003. Can’t live without it. Freedom of choice, best selection ever and all this is commercial free. The app at work is perfect. Keep up the great work SiriusXM. Love the service but need a way to access the stern show video. I have sent requests for answers to why I have no access and have had zero reply. Could you tell me why I am unable to receive the video feed for Howard sterns show. More intuitive and love the video for Howard Stern channels! Very good! I have only listened to it in my office so fate. Never miss my favorites now !! Thank you for the app! Love it in my car and now I can carry with me anywhere . App is easy to navigate !! Thank you !! Great service. Get all the music, sports, talk radio, and other programming I want on the road or on my mobile devices. Always get a great signal. Hope big increase in my renewal price in a couple of weeks won’t force me to cancel service. Soul music, Blues music, Jazz and Progressive talk, that’s all I need. Right wing talk is a waste of air time and an insult to your listeners. I only listen to1 station.....The Message. Great!!! I bought a Sirius radio to listen to The Beach Boys! It was better than awesome until the sad day when The Beach Boys we’re programmed off. Please bring them back! I love to be able to follow my Astros! Total garbage. Never works right. Downloading Stern is a total waste of times as it’ll always start from the beginning or not at all. Much better than last version. Still seems like it could use some usability tweeks. Overall it is good. Good app but need mark points where previous listening stopped - similar to HBO Go. Long listens on demand are difficult to pick up again if not heard The whole way through. How difficult is it to get a stable workin g app? I swear the frustration of this app makes me want to discontinue service. Thanks for deleting my favorites, again. All conservative radio stations. Hmm. As the title reads. Terrible app. Very spotty, always have problems. Unreliable. Downloaded content resumes play at random spots. Despite attempting to toggle “tune start” even though I only listen to talk stations. All of my “favorites” randomly disappeared. I cannot adjust any settings without receiving an error message that that option is no longer available. Please take some just a minute or two to test the updates before releasing them. Please This is truly the only app I’ve ever used that sees ZERO improvement with updates. App plays downloaded content at random starting points. Controls stop working. The app must constantly be deleted and reinstalled. Downloaded content doesn’t play back properly and must always be redownloaded app which still doesn’t fix the problem. I hate this app. You will, too. Updated this app today (9/5/18) which turned the app useless. SiriusXM is great except for the fact that I can’t listen to any of the Latin channels without the App. I just purchased a vehicle without XM installed. I downloaded the app and can now listed to my favorite music. Thanks XM radio. So happy that my favorite channel has not vanished with the unofficial end of Summer! Need to add more selections to the channels so don’t hear the same songs all the time. Gets really boring and repetitive. This app has improved with each new version. It is reaching greatness. If Stern stays past the next two years this app will only get better. Too many repeats ever single day. Way too much. Great app for listening to your channels, but finding on demand shows even on popular stations can sometimes be really tough. Would like to see it cleaned up a little in future releases. Great app. Costs too much when in cars. Great programming but I feel cheated because I have to pay for a subscription for both car and my tablet. I only spend about 30 minutes a day in my vehicle. This is corporate greed! Peter Asher’s top 100 is wonderful, educational and downright a pleasure. Absolutely a gifted personality and radio DJ . I can’t turn it off. Insights without ego and opinion, well, he has some but the opinions are with some merit and who cares. Next to Tom Petty’s buried treasure these two are diamonds for the XM brand. Beautiful. Take a look at slacker app, when you press the album art you get lyrics, press again for review of the album, press again for bio of the artist. And web site is slow to respond. This App is awesome to have at work, makes the day! I take my phone everywhere I go. I love talk radio and also classic rock. Doesn’t get any better Than that. I love the service and I love the app. Recommend to all. No suspense here..... it’s ALWAYS great. The standard selection of stations is very diverse. Along with the special presentations this service has turned into a necessity. Many thanks. Thanks for the free preview! I told my father about you and now, all of a sudden he knows how to use his smart phone! How weird. Some of us have hardware that needs a little help to sound good and some of us CARE how things sound. If Spotify can do it, SXM can. Love the sound without the commercials. Very relaxing. I miss the My Mix feature. Bring it back and I’ll change my review to 5 stars!!! Headphones and Sirius XM! Hands free and do what you will! Great ap. Glitchy at times. The ap does what it’s designed for. Fox News has rewind and skip features. Wish all other news channels had that option.also wish there was a default toggle switch to automatically remove all commercials when replaying news casts. I was one of those people that said I would never ever paid to listen to music on the radio. Boy was I wrong. See I started out with the free in vehicle purchase and with that 3 month demo I got addicted. First to the comedy channels then moved on the Elvis and the Garage Bands. But my ultimate favorite channel is 60 on 6. Then my husband found the NASCAR, CNN and Classic Vinyl channels. That was it we were hooked, now I have it in all three of my vehicles , my portable one is in my trailer, on my tv with Dish Network and all three of us have the app so we can listen to our favorite channels throughout the day. Absolutely LOVE SiriusXM. I should have activated my iPhone at no-charge years ago! So glad they recently added Apple CarPlay, but what is wrong with SiriusXM not offering chromecast functionality? I’m not paying for streaming subscription until they add Chromecast. It would be a great asset to listen at home when doing household work. Until then I will just use this the few times a year they have free previews (like Memorial Day and Labor Day). When play is hit after pausing during the Howard Stern show often times the timing skips forward to the live show. I’m happy with the service. I’ve been a listener since SiriusXM was two separate stations and since the merger it has been a 500% improvement in my opinion. My favorites section has all kinds of duplicated channels. Some items in the favorites I’ve tried deleting (Garth channel never added in first place) numerous times and they reappear after editing is closed. The huge boxes viewing of each channel make much more scrolling than prior version of app favorite section. Current app leaves a lot to be desired for the steep subscription price. Very unhappy. I wish the streaming was included in what I pay every month for the ability to listen to music in my car. Every time I try to login from my phone, it reads cannot find account, even know I use this same app an account for several days!!. Even though I am paid up! Are you kidding!!!!!!!!!. Don’t waste your time and money!!! I like the large variety without commercials, but I wish there was a way to switch between favorite channels easily. Major issues with CarPlay since the iOS update. Favorites list doesn’t load a lot of times, when it does the list of channels flashes uncontrollably. There are times when the screen is just blank. No CarPlay apps and this only started with iOS update. I use the app on both iOS and Android. The biggest problem I have on both is the screen scrolling. If you touch the wrong part of the screen to scroll down it rewinds the stream. This is most irritating if you mainly listen to talk radio on here as I do. I love my XM SiriusXM. Been a loyal customer for decades. Love to drive, especially cross country with no commercials. Also enjoy getting everything. Music, News including CNN, Fox, Bloomberg, and Several NPR channels. When I get bored, which is hard to do, I love Comedy. Overall, I wouldn’t be without my SiriusXM! Love the 40's channel and Radio Classics! It seems to me there’s more options on the app than when I’m actually in my car. Is this accurate? Or am I doing something wrong? All the best of all the genres! I love being able to put in an ear bud, turn on SiriusXM on my iPhone, and go out into ( & around the globe) world and stay connected. Music + news+sports+ comedy. SiriusXM, you complete me! I love this app. Its way better then iHeartRadio and it even works when you barely have service! Very clear and I never had a problem with it. Downloaded the app after paying for the all access. Their app continues to say no internet connection when I try to sign in on my phone. Keep in mind that any other app performs just fine when I am using it to stream whatever it is. SiriusXM is nothing but a bunch of used car salesmen. Been a customer a long time. I don’t listen to regular radio anymore. I guess about 15 years now! Uh guys this thing still doesn't support AirPlay. Pandora and everything else does. What up? Just got connected after switching from old to newer vehicle, in a long distance moving moment half here half there and a sweet assistant ironed it all out, for my listing enjoyment!!! Thank you!! I like Steely Dan and Elton John but they’re played TOO much.. Also, the only Charlie Daniels song I hear is Devil Went Down to Georgia I would love to hear more Poco... especially Rose of Cimeron and Indian Summer and also any Tower of Power. Thanks! I am so glad to see this channel selection back. Of all the years I’ve been a Listener, this is my favorite channel. Bought my first XM kit around 2003. I’m a proud music snob and needed a better music outlet than what was playing on the radio. I miss the Fred and Ethel channels since Sirius bought XM, and more so, the College Radio station they recently removed. UGH. But the Indie 101 is pretty good. Living in Los Angeles, you’d think you’d get good radio stations. Alas, that’s not the norm these days. So thank goodness for satellite radio! This station is the very best for truly classic country!! I had to drive about 8 hrs over Labor Day wknd and so much enjoyed Kenny Chesney and his entire road crew giving their overview of their 43-city tour over 2018. I loved the backstage stories, the interviews, the favorite moments of each persons memory of the tour and all the great music. I definitely will be back to see him live at a future stadium tour some day and thanks for broadcasting this for free this wknd. Love No Shoes Radio & love No Shoes Nation & Kenny Chesney. How about more contemporary Black comedians or all Black 24 hours comedy shows and stand ups. Or a Richard Pryor channel 24 hours. Kat Williams shows. I have SiriusXM in all three trucks & on my phone. No junk radio for me. I’ve tried other competitors in the music entertainment business...the problem is none of them can compare themselves to SiriusXM. The benefits and different packages as well as pricing no one can so no....once you’ve listened to the variety of music you can’t stop, the music is so entertaining especially when you can stream not only in your vehicle but on your table, cell phone and your smart television how great is that. I’m truly a SiriusXM customer for life. Nice when out and about away from the car and house. I wish SXM would update their playlists. Keep playing the same old tired songs. There are frequent interruptions in the connection (“acquiring signal....”), thats the biggest problem specially in the last year. It’s nice, I would like to be able to search by artists as well as category. App is to slow doing anything. Not worth the money paying for internet streaming too.. should be a free feature for what you get. After updating from iphone 8 to iphone x s i lost the scrubber bar to scrub through a news cast. I've also noticed a major slowdown in speed on same network same channel. Sirius desperately needs an Apple Watch app. But outside of that it’s great. I prefer Sirius to Apple Radio. SiriusXM is obviously very popular. I love it! But why doesn’t Sirius make it easy like for example Spotify does & be able to pay for the subscription thru the iphone App Store? Good app, but desperately needs Apple Watch support. Pandora, tune in and others already there. Love Sirius XM radio in my car & on my new Bluetooth nyne wireless mini speaker for iPhone play!! The app is great except it doesn't work properly at all via Carplay in iOS 12. Since this is pretty much my source for listening 95% of the time I'm kinda bummed about it. Limiting ability to time jump? I will cancel my entire subscription is this becomes to norm. For some the reason signs me out and when I try to sign back in says password is incorrect. I try to do “forgot password” option and says my email doesn’t match even though I have had the app for years now and subscribing customer. Also, do not enjoy how I have to find my stations on the app even though, I have like for years in my car. Bring Aguila back to car radios!!! No mamen !! This is app is great. There were days when I was in my car and and could not carry the the radio station with me. Now, I can listen on my way to work and transition the listening into the work office , gym , store etc. I rate it 5 stars ! Good stuff! The user interface needs works Recorded show is is a bad spot. Not user friendly. If all sports games live had stations like the satellite radio does. I would rate 5. Not sure why I waited so long! App great but looking for a key add on. Please can we get a Sirius radio app for the Apple Watch? This is the only thing I’m missing in my life. Going for a run or at the gym. So nice to be able to listen to this at night,or anytime on my iPad on my phone on my supported device. I like the Sirius app. Great app but please come out with Apple Watch app! Please come out with an Apple Watch app! I want to be able to go on runs & listen to Sirius xm without needing my phone. Thanks! I am only trying out this app for the new Rod Stewart station. I am loving it so far. Please don’t let it end. If it doesn’t stay I probably won’t keep the subscription. Love the Stern video clips! I’m in love with the new app and love watching all the video clips. 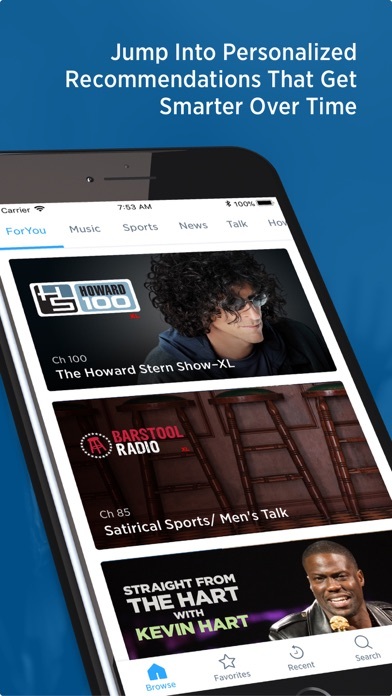 With the app I can listen to ever single moment of Howard’s show. I would watch the entire show if they had that versus just clips. Thanks for all the great entertainment!! It’s great to be able to listen when not in my car!! Very convenient, love it!! Going on day 3 of being unable to open the app with no fix in sight. Thank you so much for my APP! Have tried deleting and re- installing app as well as turning phone off and back on, but app just hangs on the splash screen. Hopefully this can be addressed asap. Otherwise love this app. I really enjoy the music. Takes me back to the good old days. The app works awesome and I can listen to my favorite music and sports!! When are you coming out with the app for iWatch? Figure it out...please! ♥️Outstanding weekly entertainment .. absolutely love every part of this show!! I need more... we all need more. Jeff you two are so great .. like Carson & McMan good .. content flows seamlessly energetic.. keeps it real.. seriously love Friday’s .. Thank you so much. ! Should have done this years ago! ❤️ it! Keep Rod Stewart Radio on the air forever!!!! Rod Stewart Radio is the best. Keep it running forever!!!!! Audible books offers Apple Watch support! How about Sirius? Would love it for the gym, neighborhood walks, runs...phones are getting bigger and Watches smarter! Go for it! The app worked well until this week. I upgraded to iOS 12 and now the app no longer works with Apple CarPlay. It worked fine before the upgrade. All of my other apps work fine with CarPlay and iOS 12. Sirius Music provides numerous channels of live multi-generational, multi-cultural music from every imaginable genre. Best part is that there are no commercials and only a few seconds between songs. Also, it is simple to navigate and easy to change channels to find your favorites. And if a call comes in during a song, the song resumes after the call is ended. Since you can listen on the go and from any device without interruptions, I rate my Sirius experience five stars since six stars is not an option. 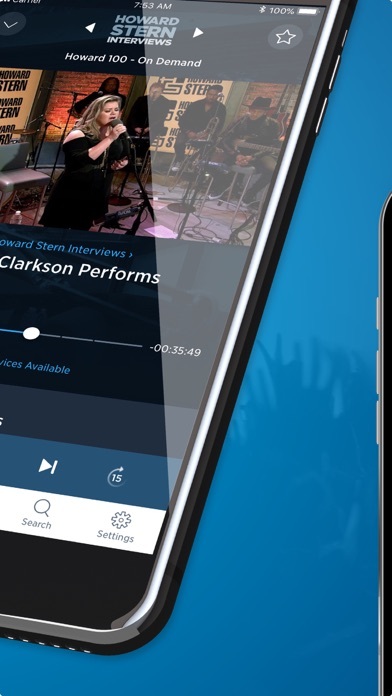 Using the app to stream SiriusXM content is better than using the over-the-air version, in my opinion. This way, there’s access to on-demand content that, while not necessarily exclusive to the app, saves from having to tune in at a specific time to hear it. Aside from it being about a song behind, it’s very good. This app is interfering with my music listening, but, I’m not complaining...it makes the value of Sirius even better than before! This is a rip-off company that will mislead you! After paying for two ‘lifetime’ plans several years ago I’m now in a position that I’m having to pay to keep one of them and on the verge of losing the other; unless of course if I opt to start paying for that one also! Do NOT trust them!! Always something good on- definitely my favorite way to listen to music! Before the update, the app would crash. After the update, the app crashes, and/or freezes, and I have to force close and restart the app. Seems SiriusXM just can’t get the app to run smoothly. iPhone X Star rating is going down. After recent update...app still crashing whether on LTE or WiFi. Hope they get this fixed before my renewal date comes up. iPhone X Verizon *update 9/21/18*. Why does this app still crash after about an hour or so of playing? I never have any problems with the iHeartRadio app. Your time is running out till my renewal date. From my living room, to my car, to my cellphone I don’t miss any news!!!! Issue with favorites is still the same..even after the update. Cannot delete favorites at all. They just appear that they are loading and that is it. App functions well on its own, but is completely non-functional with CarPlay. Freezes, screen changes from current song to favorites on its own And goes back and forth. Not usable with CarPlay. Now that waze and google maps integrate with CarPlay, I’m using it more and hoped this app would work. So much for that. Also, support stinks. I contacted app support and they had me call tech support. Tech support told me to call apple. Right. Like it’s apples problem. How about you call apple and figure out why it’s broken They said they had no reports of this. I searched the recent reviews and found 1 similar report within the first 5 reviews. I asked for a supervisor who seemed to care and “escalated” my case. Have not heard back. Please fix. Must own for music lovers! 6 months at $25 is a no brainer! I’ve subscribed for 2-years and can’t imagine going back to FM radio. No commercials, phenomenal hosts, and multiple stations for every music genre! If you love music this app is for you! I have all access and love it. I have enjoyed SiriusXM for many years and will continue to for more to come. Your favorite channels can be saved to fit your listening appetite. Simply the best all around radio for your listening pleasure—none better! I love some of the programming and would rate this 5 stars if I didn’t have to listen to commercials on a service that I pay for. Terrible problems on iOS 12 on iPhone X Crashes, streaming stutters even on 100mb+ network, randomly freezing interface. CarPlay is completely broken. Even before iOS 12, saving/reordering favorites was garbage. Still garbage. Additionally, I see so many fake raving reviews for this app. Too many for it just to be stockholders and their relatives. Clearly, they are paying a company to pad the stars. Hey, click on “App Support.” It takes you to their mobile interface, that is from 2008. What a joke they are. Starting using more since I have Carplay now. Favorites would be very helpful for while driving. Cannot remove extra favorite channels or rearrange them. Hit Edit, get them all just the way you want. Hit Done and all changes go away. Please fix! Love listening to Broadway in CA anytime of day- not just showtime! We pay for this to hear non-stop or close to it music. There is so much talking on the 60’s channel and the old country that I can hear it on regular radio. We are dropping it. I continually need to enter my password and the app also does not use Face ID. Really easy to use thanks for the app usages i really enjoy so easy to navigate. I like it. Good stations. Expensive though. While its rather expensive, my love of music and the variety with the ability to listen anywhere anytime in my Jeep or phone, is priceless. 7 years and counting. I adore Sirius Radio and am delighted to be able to stream it on my iPhone...Beatles top 100 weekend is awesome! Usually I listen to the Bridge but I know there are other great stations to listen to! Like it but it freezes quite often. App freezes a decent amount. 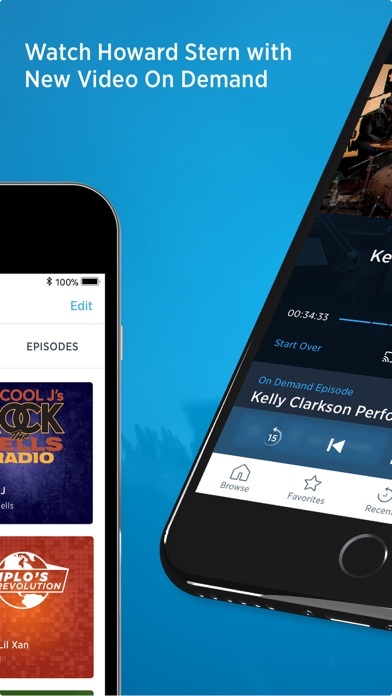 A huge bonus to your Sirius XM subscription! Being able to stream my SXM over my phone is a great benefit. Bluetooth-ed to my portable speaker on the patio with a beer in my hand - doesn’t get much better. This app is amazing and flawless! Always catch sports and shows on demand without delay. Just added the app to my phone listen all the time in my car now work can have some calm. I only wish there was not that big of a delay....otherwise fantastic! Got a two month subctpription in my Charger but after 2 weeks all the extra features stopped , turned me op as really enjoyed gas,sports, movies and the weather Wichita just stopped even throw it shows I have it??? Thank you for free2 weeks love XM commercial free choice of music. Doesn’t recognize my email address or password, even though I just used both to sign in via a web browser. Says my email address, through which they send me emails & I use to login via a browser, is not associated with any account. You rock! Love The Cuz! Listened to him on WABC New York on my transistor radio back in the ‘60s. Best music app I know of. Includes all music formats. I still think the pricing is too high. $70+ per quarter for me. Half that would be acceptable. Not sure how long I can hang on . Thanks for adding Shag Channel for vehicle subscriptions! It’s about time to bring it back - and please let it stay! I listen to it all the time and the app is great to have along too. Having this app & listening to The Beatles top 100 with Peter Asher made my weekend! I’m a long time listener - over 10 years. SXM lost a lot when the Loft came off the satellites and lost most djs. Best station on sxm. I love taking all my music, news, talk, and especially sports with me! Just about EVERY NCAA Football game I want to hear!!! Love it...I don’t need to sit in my car to listen to talk radio. I have had SiriusXM in my car for 3 years. I was so happy to discover I could put it on my devices. I love Soul Town!!! I like the app but as of 10-17-18 it stop working and will not recognize me any more even though the correct info is used since I am able to use same info to log into the website. Edits and deletions in favorites section don’t save. Otherwise, it’s great. Love listening to it at my office, the golf course, all over. I’ve used this app for several years. Always liked it. Then You took away the person preferences for my favorite channels. It was nice to be able to program my channels to the music I wanted to hear, you guys ruined a good thing. Please bring that feature back. Excellent play by play commentary! I have not been able to play back a downloaded stern show since the update. The app keeps crashing. And that's after you wait for 15 minutes for the show to download over wifi. Way worse than the previous app. This is the only app that will consistently tell me that I am off line when I am not. It is very fragile and I am always nervous when fast forwarding as it has a tendency to cause it to crash and then tell me that it is experiencing technical difficulties. SiriusXM on demand, especially Stern video still makes it worthwhile. Us Sirius radio when I walk, work, drive or just relaxing. Love the variety and dependability. Constant freezing and flickering on my favorite channels. Once even locked up my Pioneer units CarPlay and I had to turn the radio power off and back on. Please update ASAP!!! Enjoy the music always, great!! Howard Stern is absolutely the best and the reason I have this app :)! Not that impressed, this is why! Listening to only the Highway.....Love the songs and variety of stations but being limited to 6 skips is absolutely ridiculous. Especially when we, the customer, are paying for it. Also saying commercial free should mean talking too. On the weekends Margaritaville is not only talking but repeating over and over again. We should have an option to hear or not hear margaritaville. Again, paying for something and still limited to what Sirius wants us to listen to and how many times we may want to repeat a song or skip. Having SiriusXM on my phone makes my subscription that much better!! The lone conservative voice amongst a sea of liberal satellite talk radio. I love that I can listen to Wilkow and Levin! I love this app and the new update is great! Radio Andy is my favorite and EW radio! In a work truck with no SiriusXM!!! Glad for the app. Every 15-20 minutes the audio briefly cuts out. Fix this please. Why does channel 113 (Fox Biz News) continuously shut off after 25-30 minutes? I have two iPhones, one on AT&T, one on Verizon. So it’s not my service. SiriusXM please fix this! App doesn’t work at all and is not accepting login. Not a problem on my end as I am able to login to my account through the web without issue. I just downloaded the app and it’s awesome. Seriously though, I need the emo project available in my car so I can feel like I’m in high school again. Howard is the best!! Only reason for sirius. App should have adding a listener at discount. It’s pretty expensive. We pay double per month and my husband and I only listen to is Howard and Jay Thomas But he has since passed. RIP. The new Howard video is awesome I will admit but It does freeze sometimes while the app has gotten progressively better in the past couple years...I will be canceling once Howard leaves. Would give it 5 stars if it had a built in sleep timer function. Excellent sound quality and music selection. Absolutely perfect. Great variety and service. Thank you! Love the variety, love the fact that I can listen from my IPad! Channels are reasonably easy to locate, but sports games should be easier, especially on the car radio where there should be better highlighting of the showing the teams playing when searching. Love the variety of music!!! Works everywhere I have service. This is the best choice for everyone who wants to have a wide variety of radio stations to listen to. You have music, talk, sports and comedy all at your fingertips. No matter where I am I can listen to the Green Packers games. It's a Great App when it's working, It stops working after a couple of Hours. I really love this app and SiriusXM overall. I don’t like the fact that in the new version you can’t customize the stations. Please bring this feature back! Compared with the previous version, the current app is a nightmare when trying to navigate to certain channels. I used to be able to find a category of channels... Talk, NFL, Classical, etc... to search through. Now, I need to know the channel number to find, say, the SD Chargers live game feed. Also, easy searching for earlier-in-the-day shows on a given channel is impossible. Stop asking questions in my app! I love having a variety of channels to listen to great music! Some times I lose the sign. This is awesome, and amazing. This is the cable TV of music. I don’t enjoy sitting still and binge television; But, I can listen to music, comedy, talk shows, and even Howard Stern whenever I choose to. And I can continue working on whatever projects I choose to do while listening to Sirius. You can’t do that while sitting down binge watching TV. Love SiriusXM app and radio. I drive a lot and ride a motorcycle love having access anywhere I am. Thanks SiriusXM for being there!!!!! I’ve had Sirius for about 10 years, if it’s been in existence that long, and I split my time listening to MSNBC, and Vegas Sports bet, at home, and in my car. Sometimes I listen to other news, and music, especially Seriously Sinatra, and Real Jazz. Overall, most of my listening pleasure and information source, you can’t beat it. Need The Beach Boys Channel back! To much graphics slows things down. Every time I reorganize FAVORITES, I save but then it goes right back. I’m able to stream my favorite stations here at the office, and it’s easy to use. I enjoy this app! I don’t know what I’d do without this app. Best app on my phone! I love SiriusXM and this app ensures my favorite music is with me wherever I go. SiriusXM is with me while I run, workout at the gym, or when pairing my phone with a portable Bose speaker. So while I cook in the kitchen, layout by the pool, or take it on the road for my hotel room, I set my phone and the music to the mood. Enjoyed Willie’s Roadhouse while in Nashville, tuned in to my favorite sports teams playing or selected 60’s on 6 with Phlash Phelps’ traveling tips while on the road, and of course, put on Classic Vinyl when playing beach bunny on a So. Cali shore. Become a subscriber and you will never look back. Worth every penny. App keeps asking me to log in. Then it tells me it doesn’t recognize user name. I try registering and it finds the user name and when I try to finish registering or log in again it says cannot find user name. I’ve had Sirius for a long time!!!! Connection stops for no reason from time to time! I'm enjoying this entertainment option. The sound is clear and uninterrupted. I am very pleased with my subscription. I decided on a trial of streaming access because my 17YO high school Senior now drives the car which has my subscription service. This streaming service is the best!! It gives more options for tuning in, catching old episodes AND it is the only way I would have been able to hear the classic episode of Clay Cane’s phenomenal interview with Omarosa! In addition to my favorite channel 126; I can catch classical music, NPR Now and other favorites anytime! Handy to catch up with things I missed in the car! Can I list songs or artists? Just got it. So far it’s great. I would love to have a printable lineup. Can’t figure out how? Love everything else! I really enjoy commercial free music in specific genres. Serius is awesome. Never had a problem. Amazing to have everything SiriusXM on your phone. No wires, no antennas-great. Been a listener for over 10 years, favorite channel is Radio Classics! They play the best remixes to every artist out there. The best radio in the world, SiriusXM all day hands down. And the best station is 126. THE BEST MUSIC HAPPENING ANYWHERE ESPECIALLY IN CENTRAL FLORIDA”!!!! Love Howard!!! 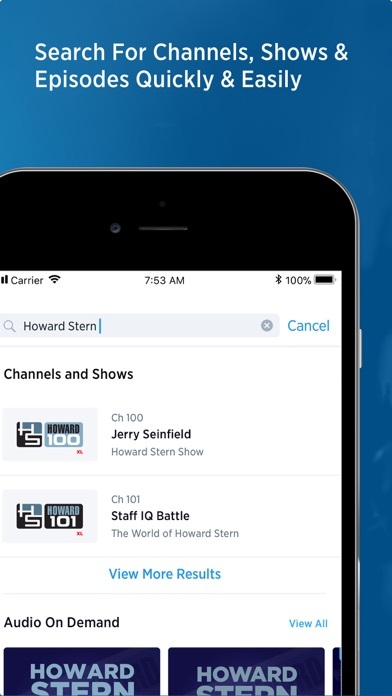 So excited now we can watch videos of The Stern Show on the app!! Save my addiction to foxnews. Would give 5 Stars, but the price is cost prohibitive. What happened to them? I use this app literally only to listen to here shows from the days I miss. Please fix or bring these back. Great way to have music in the garage or anywhere you want it. I use it with my JBL beer can speaker everywhere! Love having this radio I’m got it for my car first now setting up my cell and lap top for it’s use. Great music and it’s available wherever you go. Prefect for road trips and on your iPhone!! I decided to add streaming to my plan recently so I went online to see how much extra it was going to be. I was excited when I saw that it was only $5.00/month. The option was the default selected and so was the radio to which it would add it to, not surprisingly since it was the only radio I’ve got. So I proceeded and clicked continue and suddenly the price changed to $15.99/month. My card was charged and I was pretty outraged to say the least! I contacted Customer Support and had to be transferred three times, once because I couldn’t understand their foreign accents. After multiple times of me explaining what happened and asking why all I got was “It was an old promotion” that accidentally was available. Yeah, a complete crock! Then I’m forced to hear about other promotions they’re trying to up sell which only makes me more upset (they rudely insisted on me hear them out!) and these promotions will expire after a year and I’ll then start paying triple my current plan. I spent an aggravating half hour on the phone with “support”, and I use that term loosely, which has soured my respect for SiriusXM. I pray to God I never have to call them again! I finally got my plan back to normal but I have to wait up to a week for the charges to be reversed. Bait and switch. Disgusting business practices. Awesome app to support your subscription, enjoy the favorites tiles and listening when I walk the dog, or are within WiFi or cell range. Why do loyal listeners get charged during recruiting periods? 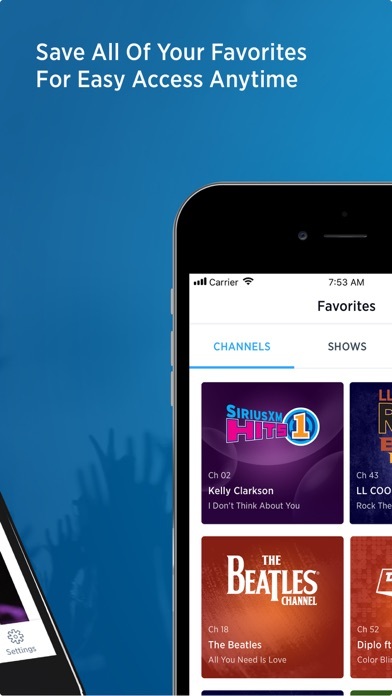 Loyal subscribers pay for their subscription while Sirius gives the service to non-subscribers for no fee. Every subscriber should be given a credit for the time the service is given away free. This has been going on for a while and it is not fair. Class Action? Where are the plaintiff lawyers? Money to be made here. I’m really digging it. No commercials for outside things & stuff.... yay Now, I’ve been listening for 3 months in my car & streaming wherever I can. Now that’s the best! My only compliant is That with all the music a musicians make, channels still over play the same music. I get the programming of shows at least twice a day. I just wish the played more of an artist from their past, present. Not just the popular.... you never know what will catch a persons ear and turn them on.... Siri’s is better than regular radio. But I still don’t like the repetition over the course of these 3 months. I am in my older years & appreciate Sinatra, Radio Classics, The 40s, Joel Osteen, some news/business, and a few other channels. I can listen if I wake up in the middle of the night, or in the car. My only wish would be to lower the price, especially since I use such few channels. How about a 15-20 channel package??? I have a active subscription and I can login online with no problems whatsoever. But the app...... it says it can’t find anyone with my information. What the crap!? Awesome on Lake Huron on our boat fishing!!! Great once you you can get what they promise. I have loved having SiriusXM. I received it as a gift from my daughter so I could listen to baseball. With it, I can hear our beloved Cleveland Indians from my home in New England. (We lived in northeast Ohio for 17 years.). Problem was it took days and several calls to get what my daughter paid for. The station I needed didn’t come in on my radio and it seemed to be quite a problem to get it to work. Worse yet, my husband on a totally different account tried to add the Indians station, and while SiriusXM was quick to charge him for the extra station, they failed to let him know that for some reason his brand new car had the wrong type of radio to get the higher stations. (He already has a basic XM radio package, so still have no clue what the issue was.) The reps that help are very nice, but it should be as easy to get the stations you are looking for, as it is for the XM folk to take your money. Thanks Serius XM. I can listen to my favorite cable channels without the cable bill. Now I listen to 80’s wherever and when ever I want! Thanks for this great up! Just got a subscription and love it!! But is it possible to download Grateful Dead shows? If it is that would be a great feature! Great app. Great selection of news. Sports and music. Love radio Andy, esp reality checked and Jeff Lewis live. Live for those shows! It’s nice to have your type of music, Commercial Free. I have the app, Computer, and in The Car. BOYCOTT THIS CORPORATION- To ARTISTS AND ALL USERS ALIKE For anyone and everyone who understands the concept of working hard on something that you create whether it be music or your next project for your job or anything that you put time into in which you expect to be paid for it you understand how painful and extremely disheartening and unfair it can be when you do not receive the proper compensation for those efforts. This corporation is one who has been in a prime example of lack of compensation don’t believe me check out this fun fact. For the last 10 years, there is approximately $1 billion that SHOULD HAVE gone directly to artists royalties and sales for those folks who made that content.... which this app so “easily provide commercial-free” like it’s oh, soooo convenient for you. Well, the next time you listen to the app from an actual thievery corporation, just remember how under-compensated the artist who work hard on their craft are. This day and age, why there is still such a thing as a HARD WORKING starving artists. The best thing they ever did was put this on an app, absolutely love it. I listen to Traditional Irish music year-round, not just during the month of March! With all the genres of music you carry, and all the sub-genres, it seems to me that you could easily find room for an Irish Trad station within your permanent offerings. Your service is not cheap, and my renewal is in doubt. This stuff is great! I LOVE it. Keep up the good work. Love the ability to have the app. However, the lulls can be irritating. But I like ch 51 best. I’m an old die hard rock-n-roll fan it it got boring....same ‘ole same ‘ole. BPM I feel like a NEW person! Have been listening to it for yrs now! Can’t live w/o it! The quality of the service and the reception is great! Met him over 50 years ago. He bought my friends and me a beer and visited with us before he went on stage. Wonderful guy. This app is great ! I rated it low because I feel their is to much talking on a paid subscription less talking more music . Easy to use. Love the live sports ! Also nice when you’re listening to something in the car and want to finish when you get home. Easy to open the app on the phone and continue ! This will stay a 5 star as long as you would keep Dave Matthews Band. Great music can’t go without it! Get Siriusxm, it is the greatest collection of music channels around. Once you get Sirius you will never go back to terrestrial radio again. Constantly stops playing. Very annoying!!! Just downloaded the Sirusxm app Can’t wait to enjoy all my favorite channels that I listen to in my car. Xm has raised their monthly fees over the years. Sad that they don’t give discounts for subscribers that have multiple devices and cars. Dropping service soon. Can you say Pandora? In order to maintain your 5 star rating, please bring back your lifetime subscription at a reasonable price. I really love Radio Classics, Joel Olsteen, Bluegrass, 40’s Junction & others. It’s so nice to be able to choose what you want to listen to while out & about, and with the app I can use it at home. Awesome! Wish app had a queue or play next feature for downloaded shows. This app works. You get access to all your channels as expected. However, for the amount I spend yearly I would think there would be a better user friendly design, search/finder layout and various other features. But overall I can listen to all the great programs they provide. Listening to Y2Kountry a lot. It’s fun hearing the actual Country stars DJ. Whether it’s the deep voice of Trace Adkins or Danielle Peck’s funny commentary during her shows. It’s refreshing to hear personal stuff from the artists. Keep it coming! Bring those back to get the 5th star. Does exactly what I need to do. I’m pleased.. Crystal clear sound. Amazing. I love sat radio. I love hearing a variety in musical genres. I hear old favorites and new songs I hadn’t heard before. There is a wide selection of formats and the news and comedy compliment it well. I am enjoying the variety of music available on SiriusXM, but I am not enjoying the additional cost of having both in my home/phone and in my Vehicle. One price for both would be preferred especially with all the free options available out there. Sort of pricey, but am glad I can get Baroque & Beyond on the computer and iPad. Love the Message station!! Only problem I can see is that I have trouble signing in?? Don’t understand why I can’t. Disappointing!! Previously, it was far easier to find shows broadcast earlier in the day,now it is much more difficult. Tney also needlessly cluttered up the interface with “recommendations.” A major step backward. I rated 4 stars because I here ALOT of repeats. I only listen to The Heat and XM Fly. I feel like there is so much music out there in those categories why would there be so many repeat songs?? Love the different variety of the stations. The Aretha Franklin tribute is fabulous and graceful. A job well done. Joe Madison and Urban View is great! All sorts of genres for those with changing tastes in music. Pause & resume hours later. Pretty stable. Best purchase ever. Listen all day every day. So many excellent channels. Music for every mood. I love this. It’s fabulous to have what I love to listen to in my car now at work. Update: Another Sirius app update a few days ago but the app continues to crash. The app still crashes 3-4 times per day so nothing has improved. Still a 4. No crashes will get a 5. The last update has caused my iPod to crash frequently. I listen at work and it will crash 2-3 times per day. I'm sure this will get updated and fixed but as of now it's a bit of an annoyance. I am getting used to the new interface as well. It's all about the music for me and I get plenty of that. This review would be a 5 if not for the frequent crashing. I love the escape channel. It’s the only channel I listen to! I love this station, have been a subscriber since the start. I cannot buy a car without Sirius XM. Please consider providing two separate streaming quality selections for Wifi and cellular. I want to have best quality while I am on WiFi, but also insuring the data on cellular is consumed economically. App is great! I got SiriusXM just for the Howard Stern Show. Love how you can pick up where you left off in an interview if you don’t have the time to listen to the entire show. The on demand feature is great! Excellent video quality and play back. Zero negative issues so far. Keep up the great work!! Love SiriusXM can’t stand regular radio anymore! Keep it up. Enjoying the music selection an ease of use. Sitting in my backyard enjoying these great tunes!!! Latest version restarts saved shows correctly! The app allows me to take the music with me everywhere I go and it doesn’t limit me to just my truck. I’m loving the convenience and flexibility of the SIRIUSXM app. I’m able to enjoy my SIRIUSXM account everywhere. Could not be better! Couldn’t live without it! Love to have customization of channels back. Also LOVE to have Classic College radio back!!!! I love it. I could hear my favorite stations anywhere. With my earphones on awsome. Very good app and streaming sounds better in car than via tuner would be very helpful to have either Siri or Apple car play to make use safer while on road. Otherwise enjoyable. For those of us who are visually impaired, channel numbers are spoken by Voiceover as ‘Underline Square Audio” when scrolling through Favorites. When calling Customer Service before the end of my trial, I was informed that this has been fixed which isn’t true. I’m not considering subscribing until I hear this has been fixed by a new update of the app. I LOVE the Sirius Xm radio App! I can listen to all my news channels wherever I am. Easily able to flip between ideologies with the click of a news channel. Flip from music genres with a simple click as well. Howard Stern all day everyday with loads of On Demand options . Wherever I am I know I can hear what I want to hear. 24/7 individualized entertainment!! I use is everyday!! I like the amount of channels to listen to but this experience is ruined by commercials. So, so many ads. The whole reason I paid for this in the first place was to escape from annoying ads!!!! The app times out frequently, and it gets frustrating. When it is up and running, I couldn’t be more pleased. Couldn’t be happier that there is indeed s real deal, a real just music radio out there without 50 minutes of commercials after every songs! Oh, did I also mention that finally a true satellite radio supporting variety of music and songs without playing a song 200 times in less than 5 minutes! The Sirius XM Radio in your vehicle may be great for you. I find I get the most out of it streaming on my computer, smartphone, television and tablet. I still have it in my vehicle as well. That is not required though. I recently found out that this was available. Love it! An improvement would be to cue the last station listened to when you open the app. Best radio app by a long shot. Suffers from losing place with connection interruptions and battery drain issues. SiriusXM offers your favorite songs without interruption of commercials! The quality of the SiriusXM signal is noticeable. Love it. Would give it 5 stars but for the fact that the “previously on“ segments often do not show up on the app. But I love the ability to go 15 seconds forward and back. That was a nice add on. Could not walk 3moles daily without SIRIUS RADIO on my iPhone So many medical channels and political channels to choose. Love it!!! For visual impaired users the channels are no longer labeled to work correctly with Voice Over software built into the iPhone, it just constantly says “square underscore audio” on everything within the app outside of the bottom menu bar.. Please Please get developers to fix soon, thank you. I absolutely love love love listening to Howard Stern. Always very interesting interviews. And he makes me laugh. I subscribe to get Sway in the morning. I am enjoying the app and the service with XM. I do however use pandora more because I can 👍🏼👎🏼 the songs and it learns what I like. Porsche and I love driving listening to music or comedy. When you ride with us you enjoy it as well. I love my Sirius XM radio! I love the option to use it from my phone too! There is a Chanel or two or three for everyone. Best radio experience ever. I have always loved Xm. Glad I get it on all my devices now. The app is OK, it would be better if you could move forward and backward in a live show with more Percision. If you’re listening to a show and want to skip ahead you should be able to skip ahead a certain amount or skip back a certain amount. I enjoy SiriusXM In the car and I can also take it in the house when I get home. The SiriusXM app is awesome and allows flexibility in my life. I recommend the Classic Radio channel programming... Also, BBC news and NPR programming gives me a wider understanding of world news. Finally, Jazz, R&B, and the decade channels (I prefer the 70’s) offer great listening opportunities. Sirius XM - Expand and Entertain Your Mind! Oh yeah I’m keeping this..I used to think, why pay for radio when u get local stations for free?? Man I was wrong!! Hear what you’re in the mood for or just flip through the favorites and u will find something u like. U will also hear songs not on the regular radio and SONGS U TOTALLY FORGOT ABOUT THAT U USED TO LOVE!! I had it in my truck and just down loaded the app and can’t wait for friends to pick stations and hear good music at our bbq’s. I bet I’m gonna love this on road trips switching from music to talk shows and comedy etc.. YEAH ITS WORTH IT TO GET IT. One of the best...top notch!!! Great app/ entertainment! DMB Radio must stay...awesome channel!!! The changes to downloads has been for the worse. I find it difficult to find downloads and then play them. It was great when you would give band info when their song was playing. Sometimes when I play an episode that was recorded, then I pause it, then I go to replay, it doesn’t pick up where I left off. It stars from the previous time I paused. I can’t put into words how happy with the music delivery and apps SiriusXM has provided. In my car, in my home and carrying around and playing it on my phone. The old app allowed you to be able to create your own “Mix” which would give you a few options on what type of music you like. This app doesn’t allow that to happen. I’m very upset that the new app doesn’t have this feature. Can’t get PGA (92) or Fantasy Sports (87). Some hardware/platform crap that they can’t fix. Really??? I can get them on the app. Recently retired and do not believe what people say, it’s much better than that! Serious Radio tuned to Real Jazz is with me everyday and prefer it to watching television, trolling the net or reading. Listening motivates me to do chores, start a new project or just move to the music. Watching others of like age, am stunned how technology has transformed so many into bots. Keep swinging! Fixed the pausing issue. Thanks! Love this app. Stem and E Street radio!! I love the Sirius radio and the app because I can listen any music genre whenever I want. Love my app I can take anywhere!!! I use it to clean house and now out with it poolside!!! Sirius and summer days you cant be serious you dont have it!!! The only reason I gave two stars instead of one is the concept is great. The on demand shows and interface to search and find content is setup decently. It just doesn’t work. The app crashes constantly especially if you try to skip forward or backwards even if you download the show. In order to play content you are forced to close the app and reload. The app doesn’t respond well to Bluetooth start and stop commands from headsets. It’s a long way from the original garbage app, but I don’t understand why they can’t get this app to the speed and responsiveness of other streaming apps. Swimming in an ocean of THE Queen of Soul sound. THANKS SiriusXM!!!!!!! Why have an app when it’s not user friendly. Tried for 30 minutes to get an account set up to no avail. Screw this app. Love It! Keep up the great job well down! I love the controls at my finger tips. I can pick any type of music I want to listen to. Keep up the great work. You shouldn't have a limit on skips when you are paying for this service. It should be unlimited. The first time I had the privilege to listen what was SiriusXM, it blew my life. I never thought of paid radio. Now, it’s all I listen too. It made my morning happy hour. I love the new version. Yes, it’s the best thing I can think about when I get into the car and in my house I continue listening to SiriusXM. Sirius XM exceeds my expectations every time I tune in. Good blend of Blues,Boogie, Soul, from ChicagoDetroit,Mississippi and Louisiana . Classic stuff. Listening to Meg Griffin’s Disorder I realize how much I miss the old Loft Station where extraordinary curation was the standard we’d all come to expect. I don’t want to be stuck in the past however, Meg Griffin’s Disorder is some of the best radio going on now. Thanks for keeping great music selected by great DJs alive on the radio. Listen to it in my car but doesn’t sink up at times on LTE bandwith. Have to keep clicking the play button. In some cases takes about 4-5 tries. Other than that I’ve enjoyed it. I simply can’t live without it. I will never go back to regular radio. This app is so special to my family and I, because it keeps us connected to what’s important in our lives. We were waiting patiently to welcome the next generation of Bennington to the payroll at SiriusXM. The only father, daughter and granddaughter show in the history of radio! The SiriusXM app is incredible. Now I ever miss Howard!!! Capability to rewind so you don’t miss anything! Like instant replay in sports or on your DVR! As long as Howard is an option I will continue to subscribe. Love listen to SiriusXM radio especially listening to Kids Bop. The version of this app has improved. The streaming lag has decreased tremendously. I use the app while driving and the app stays connected. They promised no commercials but they have more than an an AM radio station. We pay for NO/ZERO commercials. We should all demand our money back. Can say Ripoff? Howard can’t retire. Ever. Do whatever you have to do to get 3 more years. Move Sirius HQ to his bathroom. Please. I really enjoy listening to this station. Love the app! Really do. Any chance you can give the I-Phone a landscape view? Other than that...perfect!! Pure music that always tells a story and speaks to my soul - each and every time. Each and every song. God bless the Queen of Soul! When will they fix this. Knock off 2 stars for this. Change the favorites list order click save it pops back to original order. A simple issue to repeat. This is one of the greatest things that SIRUSXM could ever do so the world can connect in unity and mourn together. Thank you and I am a loyal listener.